If you’re signed up to Sky’s digital TV service, you may be considering connecting Sky to other rooms in your house. We explain the options. Upside: With this option, you won’t need to get an extra set-top box, or get an extra subscription to Sky. Downside: You have to run an aerial lead through your house to the other TV. Downside: A Sky box can only display one thing at a time. You will only be able to watch whatever the main Sky box is showing (i.e. you can’t watch one Sky channel in one room, and a different Sky channel in another). For this option, you will need to run co-ax aerial cable from the back of your Sky box to the back of the second TV set. Ideally, you should try to use high-quality double-screen co-ax aerial cable to reduce interference. You can buy extension kits in different lengths at Maplin and Argos. 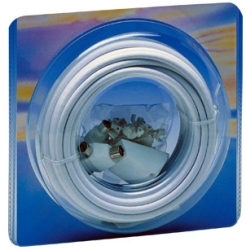 See below for an example of an extension kit. If you don’t want to use an aerial extension kit, you will need to use a suitable length of co-ax aerial cable, a bag of cleats to nail the aerial cable to your skirting board and a co-ax aerial plug for each end. Once you have the aerial lead in place, on the back of the Sky box, you will find two aerial output sockets, labeled RF1 and RF2. Connect one end of your aerial extension lead to the RF2 socket, and the other end to the second TV set. With the connection in place, the last step is to tune the second TV into the output of the Sky box. By default, your Sky box should be broadcasting on Channel 68, so tune a spare preset on your telly to that channel, and you should be in business. Change the RF channel number to a number of your choosing (between 21 and 68). It’s important not to clash with a TV service on the same number. If you find that one of your TV channels goes fuzzy, change the RF channel number again. Also note that if you’re feeding to lots of TV sets, or have a very long cable run, you may need either a splitter or booster to allow you to split and amplify the aerial co-ax output, without too much quality loss. If you’ve made an aerial connection from your Sky box to a second TV, the next thing you may want to do, is be able to change channels on your Sky box remotely from the second room. To do this, get a Sky TV Link/Eye. This plugs in between the aerial cable and your second TV set, and has a little infrared eye that you position near your TV. When you point a Sky remote at the eye, the signal shoots down the aerial wire to the Sky box, and changes channel. Sky TV Links are available from Maplin or Argos (as are spare Sky remote controls). With this option, you don’t need to run cables. Get a Wireless Video Sender kit, which has a transmitter and receiver. These connect to a spare SCART socket on your Sky box, and a SCART socket on your second TV set. Wireless AV senders are available from Maplin.co.uk. See our Video Senders page for more on AV senders. Getting a second Sky box for the other room is normally the more expensive option, but it does give you the flexibility to watch a different digital TV channel in each room. Upside: You can watch one Sky channel in one room, and a different Sky channel in the other room. Upside: Sky will come and hook it all up for you – no effort on your part. Downside: You will have to take out a Multiroom subscription for each extra box. With Sky Multiroom, you will have a separate Sky box for each room. Each box will be cabled to your satellite dish. You won’t need a second dish – it’s possible to have up to eight boxes running from each dish (the dish has to be fitted with an Octo LNB. Sky+ and Sky+HD boxes need two feeds from the dish, which means that one dish can’t support more than four Sky+ boxes, or eight standard Sky boxes. More on LNBs. Q. How do I get HD from my Sky+HD box into a second room? Go for Sky Multiroom and get a second HD box installed. Q. Can I change channels if my Sky box is in another room? Yes. You have two options – use a Sky TV Link (connected via a co-ax cable between the TV and Sky box), or get a wireless remote control extender. Q. My Magic Eye TV link is not working! Socket: Make sure that you have connected the TV Link to the RF2 socket on your Sky box, as the RF1 socket is not powered. I have tried to tune my TV but with no success.I dont seem to have any spare pre sets on my TV. I can only get a poor picture through tuning on analogue.I have a problem finding a 3.5mm connector for the RF2 output from the sattelite system. Please help now going mad. Regards Roger. Hi Roger, make sure you have connected the coax cable correctly. Don’t forget you MUST keep the copper threads/foil and peel them back rather than cutting them off – they form part of the connection and your picture/magic eye will be poor at best if you just cut them off. I have just had a new skyplus box fitted and it does not have an aerial connection for a booster box any advice please. You need to get an IO convertor. I’ve just brought one for £21 from an independent TV shop. On the back of your new sky box is an IO hole. It goes in there. Hi – Is it possible to position my Sky box in a cupboard using the WiFi solution and have multiple TV sets ? So a sender unit in the cupboard and then 2 receivers – 1 for each TV set located around the house ? My Sky+HD box does not have the RF2 connections shown ( a 2014 installation ) is there an alternative to the RF2 please? Can anyone help I have two TVs connected by magic eye that worked fine now if I have both TVs on I can watch sky on the second TV and change channels record you name it. If I put the primary TV to stand by the second TV freezes picture and won’t allow me to do anything . I have the red light on the magic eye and the 9 volt also I have metered out the cable all is okay. I have been told Sky have done a software update could this be the problem. Please any ideas would help. Hi Fred get i0 link from Maplin and connect to io port on new type sky box with sky plus cheers ,picture on other TV not HD though. I am currently having the same problem Kev, I had my relatives set up working fine for months now 2nd TV freezes when primary is turned off. I think it must be a feature that shuts down sky box when 1st TV is off although green light on sky box remains on. how do i tune in my second television when i have connected the coax to the sky box R2. I have the same set up. Everytime sky do a software update this happens. You have to do your own update. Search for it. It involves holding down the back up button until all the lights come on. Thanks do much for the iinformation. Option 1 works perfectly. Hi great site thanks you. I have a difficult set up. Sky to hmdi splitter then on to four rooms. Works great. coax from splitter to each tv using magic eye also works great. The aerial splitter im using is 2 in 8 out so aerial in and sky rf2 in..
Just installed a second tv using the rf 2 port and seems to be working fine but when I now record on the sky I cannot watch any other channel. I get a message saying no signal detected. Any help would be appreciated. hiya everyone I’m havinh difficulties sending a signal to my to upstairs with freebies I’m sick of having stupid progarammes that I don’t even use even though my daughter wants to watch nickelodeon in my room!! I have managed to set up the TV Link and MAgic Eye to my second TV and it is working fine, through a coaxial cable. I am wondering if anyone knows if I run an HDMI cable to improve the picture quality on the second TV if the magic eye will still work? If not then I guess only option is to pay for multiroom! Hi, slight variation here but struggling to find an answer anywhere else. I am getting multiroom but my tv is wall fitted (with current cables – power + ariel) hidden behind the wall (power cables come out through ariel wall unit). with my new multiroom box i want to locate this away from the tv and connect ‘wirelessly’ in terms of the HD connection. Is there any way / device / dongle that will allow me to do this? Latest sky boxes are being supplied without RF output. I got over this by buying a small Scart to RF converter from Amazon. This provided a decent picture but over time the device has degraded with small intermittent interference “spikes” – I’m guessing this method will also prevent utilization of the eye for channel changing. I would like to see Sky drop the necessity for cabled add-on boxes with a wireless extension box from the main hub = Im sure the tech is possible. I have only 1 TV running now (i.e,1 Dish + 1 sky box). Can I add another skybox (for a second TV) into this already existing setup? Hi, I currently have a sky box in my living room and a multi room box in the kids playroom. I have just built a garden room at the end of my garden, some 30 metres away. What is the best way to get Sky to the garden room? Is it option 1? Would this work as it is approximately 40 metres from living room sky box to the proposed garden room site. I just wondered if the distance between TVs and the long cable run would be a problem. Or is option 2 a better option with those wireless video sender kit? Don’t really want to get another multi room box as I am already paying a fortune each month to sky!! I have sky plus in main room and had multi room to second set in bedroom via coax cable and magic eye from the sky box in main room.This worked fine,i then wanted to change the tv in bedroom The trouble is this only scans on digital channels. How do i scan for sky signals??? Hi. I’ve recently just had sky+hd fitted in my living room. I’m trying to get it into my bedroom with a compatible tv link but I’m struggling. Can anybody help?? Hi Dave, Later boxes do not have any RF connectors. You will need an i/o link RF output box. They are available from Sky or elsewhere e.g. Amazon http://www.amazon.co.uk/dp/B00APIA5P2/ref=wl_it_dp_o_pC_nS_ttl?_encoding=UTF8&colid=JI8LY5P7G5X8&coliid=I32QMJMR27HLPP Remember to enable it using the instructions that come with it. There are some other suppliers too such as Triax too. For option 1, it’s worth noting that the Sky+ app, works as a remote control. I HAVE SKY PLUS hd box but don’t subscribe to The HD. Can I still use the RF2 Output to transmit the signal thought the house? Can I get sky multi room if my other tv doesn’t have a HDMI slot? This is all different on Sky Q. No RF out or Scart AV out. Hi We have 2 Sky Q boxes in our house and every television can accept either Box 1 or Box 2. To get TV from Box 1 we enter 1 on the TV remote and for Box 2 we enter 2. Great news about Sky TV – How to Watch Sky in Other Rooms. Is it possible to have two Sky Q boxes taht are independent in the same house? I’ve connected my second TV yo the RF2 output on my STB with co-ax cable and checked that the RF channel number is set to 68 and that the RF outlet power supply is set to ON but I can’t tune the second TV to channel 68. It simply says “no signal”.